6 Ft Rectangular Clover Spandex Table Covers Free Shipping over $150 - US 48 Contiguous States! $9.98 Flat Rate Under $150 - US 48 Contiguous States! Wholesale high quality 6 feet spandex rectangular table covers, Stretch table cover, wedding banquet spandex stretch tablecloths, oblong lycra table covers. How to Care: Spandex rectangular stretch table covers are wrinkle free, Machine wash warm and tumble dry at low temperature. Remove items from the dryer as soon as the tumbling cycle is completed. Ironing not required. 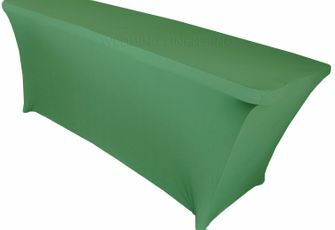 Uses: Spandex stretch table covers use for chairs, Wedding, parties, celebrations or any special event. Note: Price for Spandex stretch table cover only, table and other decorations are not included.